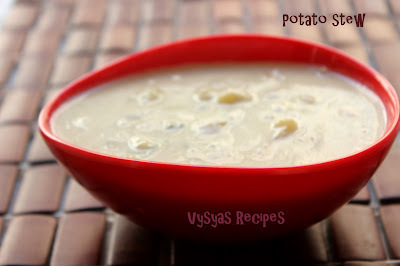 Potato Stew is a Popular Side dish Recipe in Kerala homes. It is made with Mashed Potatoes simmered in coconut Milk. Potato stew is an All Purpose gravy,goes well with Appam,Idiyappam(Nool Puttu),chapathi,Roti,paratha,idli,dosa,Mild Pulao's,fried Rice & Jeera rice.Health benefits of coconut milk includes, it has lauric acid, which has been found to exhibit antibacterial, antifungal and antiviral properties. This fatty acid can boost the immune system and its disease fighting ability.it is also rich in fiber, which makes you feel full for a longer time. Now we learn to make Potato stew. Coriander Powder - a Generous Pinch. Coconut Milk thick(onnam paal) - 1 cup. Coconut Milk thin(rendam Paal) - 2 cup. Cook the potatoes for 3 whistles, then peel the skin & mash it. Extract coconut Thick Milk in seperate bowl & thin milk in seperate bowl. Heat the oil, add cinnamon, saute till you get Good smell from it. Saute till Garlic turns light Golden brown colour. Now add Onions, saute till onions turns translucent. Now add mashed potato give a quick mix. Add thin coconut milk,coriander powder & needed salt. Let it boil in a medium flame for 8 - 10 minutes. Then add Thick coconut milk.Switch off the flame after a minute,else stew gets curdled. Now Garnish with fresh curry leaves. Take 2 cups of freshly grated coconut in a mixie or blender, add 1 cup of water, & grind it well. Now strain it using a tea strainer or colander lined with soft cotton cloth.you can strain by squeezing the ground coconut or by pressing the spoon.Now you get 1 cup of fresh first coconut Milk Extract . Then put back, the coconut shreds & again add 1 cup of water, run the blender for couple of seconds, strain the ground coconut again to get 2nd (thinner) coconut milk Extract. Again you put back, coconut shreds in a blender add 1 more cup of water, grind it, strain it. you get a cup of third coconut milk Extract. you can mix second coconut Milk & Third coconut Milk. so now we got 2 cups of thin coconut milk. 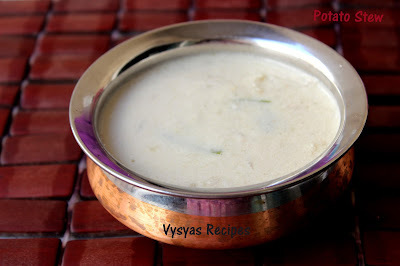 we can use the extracted milk for curries,stews or kuzhambu varieites. Don't boil the stew, after adding first coconut milk, else stew gets curdled.